Toyota SUVs: Helping you Change Your World, One Mile at a Time! So you are in the market for a new vehicle that will help you follow your dreams, or maybe just help you get the job done. The problem is, with all the choices on the market today how do you choose the one that will fit perfectly into your life? A new vehicle is a big investment that can change your life as well as how you view the world, and so this is not a choice anyone should take lightly. There are a lot of wrong choices you can make, but we believe you can never go wrong with Toyota SUVs. Since its founding over 75 years ago, Toyota has always been a manufacturer that prides itself on innovation and practicality. Today Toyota is one of the world’s most successful automotive communities, from engineers to dealers, because they take the time to carefully listen and respectfully respond to the direct needs of the drivers who will use their vehicles today, tomorrow, and many years down the road. At Toyota, and Toyota dealerships such as Joseph Toyota, it’s all about giving every driver the convenience and freedom needed to experience everything this stunning world has to offer in the most enjoyable way possible. Why an SUV or Crossover? An SUV or crossover SUV is a mastery of automotive innovation that combines the strength and size of a truck, with the grace and civility of a sedan. Versatile by nature, Toyota SUVs will be able to seamlessly adapt to any lifestyle and make it better in every way a vehicle can. You will not find a more convenient class of vehicles on the market due to their size, which are generally fitted with flexible cargo space and ample power for any journey you decide to take. The cabin is often luxuriously tailored with the best safety, comfort, and entertainment features, while the exterior can range anywhere from bold to refined or a magnificent mix of both. Toyota has a hearty lineup of SUVs and crossovers you as a driver can decide between. But in order to make things simple, here are some of the ones that really seem to get fans excited. The Toyota RAV4 is a fan favorite at Toyota with its sharp exterior, versatile interior, and practical handling capability. 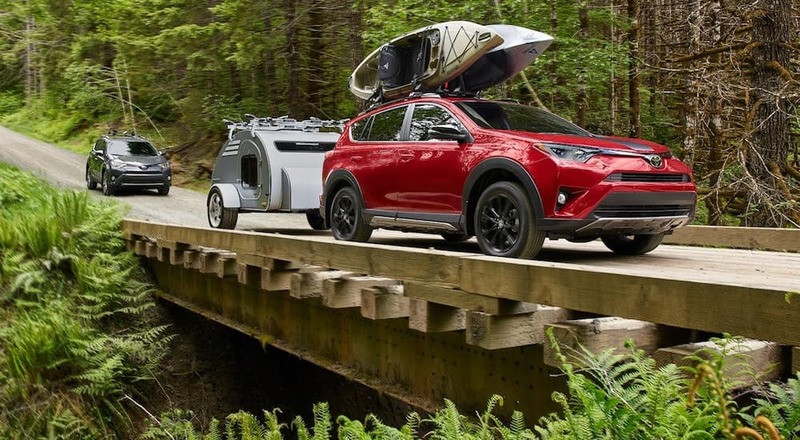 Whether you are looking under the hood or getting cozy in the cabin, it will be easy to see how the Toyota RAV4 can make your life easier. On the surface, the Toyota RAV4 is elegantly sharp with its angled headlamps and dynamic creased framework. Every inch of it gives off an assertive presence that never fails to make you feel like a legend on the road. Safety features are also at their best with an overall 5-star NHTSA rating and a generous list of advanced active awareness driver safety features. While the outside of the RAV4 is sharp and assertive the inside is actually extreme practical, comfortable, and easy going. The versatility of the size, long list of state-of-the-art features, and increased performance options are well suited for anything from a quiet weekend trip with the family or an epic adventure into destinations still unknown. If you truly want to experience the world and explore every possibility life has to offer, the Toyota Highlander is a large and commanding SUV that will push aside all limitations you previously had. This is a versatile three-row SUV that offers an abundance of practically everything you could even considering needing in a vehicle. The appearance of the Toyota Highlander is a bold and sharp at first glance with the massive and unique grille as well as the thin blade-shaped headlamps, but take a closer look, and you will see the cohesiveness and refinement of its overall smooth and direct body design. Clearly, the interior of the Highlander offers ample space that is easy to use for either comfortable passenger seating or extensive cargo loading. Packing all the gear you want and need for the next big adventure will no longer require a long and difficult game of trunk Tetris, because the only limit when it comes to the Highlander, is your own imagination. There are also plenty of technology options for your entertainment and comfort. The Toyota 4Runner is the ideal option for the more unique soul. Its design is eye-catching, and its power is imposing on nearly every terrain. If you are looking for a unique adventure that will grant you a lifetime of memories and a vehicle that can handle it with grace and power, this is the Toyota SUV for you. The exterior of the Toyota 4Runner has a lot of interesting elements that draw your attention within the first second of looking at it. The flat grille and more boxy shape of the vehicle give you a sense that you are about to embark on a wild safari. Overall, no one can deny that this SUV is one of a kind. While the outside is unique and may even be called sporty for its class, the inside is luxurious and high tech. It also has all the space you can need and an available sliding rear cargo deck for easy loading and unloading. The 4Runner is proof that just because you want an adventures doesn’t mean you can’t feel safe and comfortable while having it. 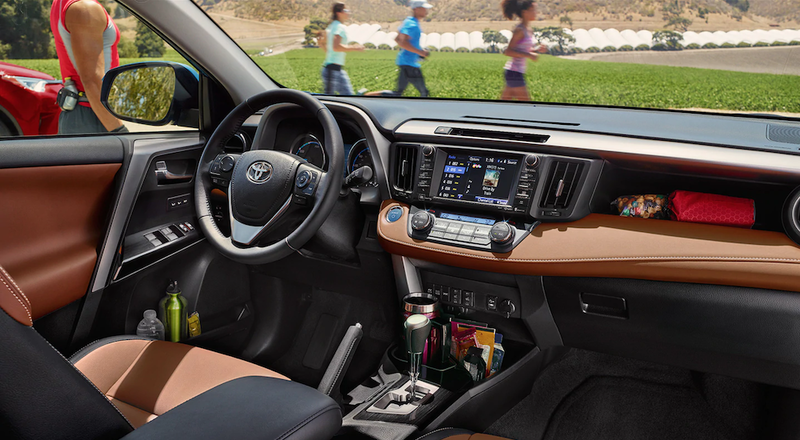 All the utility and features you will ever need are right within the cabin of these outstanding Toyota SUVs. The Toyota Sequoia is one of the biggest SUVs on the Toyota lot and can give you and your family more space than you will know what to do with. You will always be prepared with this SUV at the ready. The exterior of the Toyota Sequoia offers a fairly safe and dignified appearance that will ideally fit in anywhere, especially a family atmosphere. The straightforward and large design is extremely appealing in its own right and gives drivers a sense of bold yet unobtrusive security. The cabin of the Sequoia is roomy and well equipped for pretty much anything that could happen on the road. Active safety tech with sensing technology will keep everyone safe at all times, while the infotainment system will keep everyone entertained and connected. Bigger may not always be better, but in this case, it surely is. 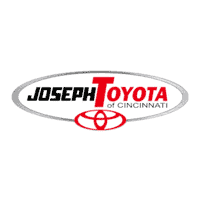 At the heart of Ohio, in the thriving city of Cincinnati, you will find us at Joseph Toyota. Attentiveness is key when it comes to pairing the best vehicle with the best driver, and that is exactly what we offer. We are an automotive dealership that enjoys taking the time to get to know you and your needs as a driver. Shy or stubborn, rich or poor, family-oriented or adventure-driven, we will be sure to set you up with your perfect automotive match. What we don’t have in stock, we can get, what you need, we will provide, because at Joseph Toyota it is all about you.